1Group of Research in Injury, Immune Response and Lung Function (LIF), Hospital del Mar Research Institute (IMIM), Barcelona, Spain; 2Centro de Investigación Biomédica en Red de Enfermedades Respiratorias (CibeRes), Instituto de Salud Carlos III, Ministerio de Ciencia y Tecnología, Madrid, Spain; 3Respiratory Department, Hospital del Mar-Parc de Salut Mar, Barcelona, Spain; 4Experimental Sciences and Health Department, Pompeu Fabra University, Barcelona, Spain; 5Respiratory Department, Fundación Cardiovascular de Colombia, Santa-Marta, Colombia; 6Department of Environmental Health, University of Cincinnati College of Medicine, Cincinnati, USA; 7Epidemiology and Health Services Evaluation Department, Hospital del Mar-Parc de Salut Mar, Barcelona, Spain; 8Consorcio de Investigación Biomédica de Epidemiología y Salud Pública (CIBERESP), Madrid, Spain; 9American Organization for the Promotion of Health Research (OLFIS), Bucaramanga, Colombia; 10Urology Department, Group of Research in Solid Tumors, Universidad Autónoma de Barcelona, Barcelona, Spain. Background: Bladder and lung cancer are among the ten most common cancers in both genders. The NKG2D receptor and one of its ligands, MICA, are associated with smoking and susceptibility to both chronic obstructive pulmonary disease and lung cancer. Objective: We hypothesized that NKG2D-MICA system was associated with other smoking-related epithelial cancers such as bladder cancer. Design, Setting, and Participants: 70 cases of primary non-muscle invasive bladder cancer were screened for the MICA expression and CD8+, CD4+ and NK cell infiltration. Most patients (n = 55, 78.6%) were current or former smokers. Measurements: Tissue microarray (TMA) technology was chosen to evaluate MICA and tumor infiltrating lymphocytes in samples with confirmed bladder cancer. KaplanMeier curves and univariate Cox analysis was used to assess relapse, all-cancer mortality and specific bladder cancer mortality. Results and Limitations: MICA was expressed in most cancer specimens examined (i.e., 70%). Relapse of bladder cancer was not associated with the status of MICA expression (log rank p = 0.1123). Nevertheless, a significant association existed between high MICA expression and bladder cancer mortality (HR = 0.25; CI95% = 0.06 - 0.97). Tumor infiltrating CD4+ and CD8+ lymphocytes were found in the majority (64%) of samples. Cells expressing the NKG2D receptor were found in only 3% of the samples. There was no linear function between NKG2D+ cells and number or ratio of CD4+ and CD8+ TIL. Conclusions: MICA is expressed in a significant proportion of bladder carcinomas. MICA expression associates with significant survival advantages in the face of both all-cancer and bladder cancer. The NKG2D-MICA system could represent a common mechanism involved in the immunopathology and natural history of bladder neoplasms. Bladder and Lung cancer are among the top ten most common cancers in both sexes worldwide . Bladder cancer occurrences are irregularly distributed, being more common in the Southern regions, and less common in Northern regions [2,3]. In the USA, 215,000 new cases of lung cancer and 69,000 new cases of bladder cancer are diagnosed every year [4,5]. In Europe almost 134,000 new cases of bladder cancer are diagnosed yearly. In Spain, 23,000 new cases of lung cancer and 13,000 cases of bladder cancer are diagnosed every year. A strong association with tobacco smoking exists for both tumors . The clinical behavior of low risk bladder tumors enables patients to be controlled for a long period of time, which in some cases leads to the development of a second primary tumor . Epidemiological studies have shown that after eight years of follow-up, bladder cancer patients show an increased risk of a non-urinary second neoplasm [1,8,9]. An increased relative risk of lung cancer among patients with bladder cancer has also been reported [10,11]. Spain is the leading European country in terms of the incidence of lung cancer and the second regarding mortality as a result of the same. Both tumors share the common etiologic factor of tobacco . Immune cells in order to control inflammation and promote repair remove cells undergoing injury or stress. Several pathways that detect and eliminate these cells have been described . A well-described mechanism that may provide a link between epithelial cell stress caused by cigarette smoking and immune activation involves NK cell group 2D (NKG2D; also known as KLRK1) receptor activation . We recently demonstrated that cigarette smoking induced NKG2D ligand expression on pulmonary epithelial cells , implicating NKG2D receptor activation as a mechanistic link between epithelial cell stress induced by chronic smoking and lymphocyte activation in pulmonary tissues. The role of NKG2D receptor-ligand complex in triggering immune responses in smokers might also influence extrapulmonary pathways that can result in aberrant activation of the immune system leading to autoimmunity or other forms of immunopathology [13,15]. NKG2D ligands are not expressed in healthy adult tissues, but are induced by infection, transformation, and DNA damage [13,15]. Multiple families of structurally distinct NKG2D ligands have been identified in humans. Two families of NKG2D ligands have been identified: the MHC class I chain-related (MIC) molecules MICA and MICB and the UL-16 binding proteins The NKG2D receptor is expressed on circulating and tissue lymphocytes and directly recognizes stressed cells through ligands expressed on the cell surface. NKG2D receptors are expressed almost exclusively on cytotoxic lymphocytes (i.e., CD8+ T cells, NK cells, NK T cells, and gd+ T cells) and can directly induce cell cytolysis, enhance innate immune functions, and modulate adaptive immune responses. We hypothesized that aberrant downregulation of NKG2D ligands, NKG2D receptor, or both, can lead to evasion of stressed and transformed cells against bladder immunesurveillance in cigarette smokers. We examined bladder cancer as a form of epithelial tumor associated with chronic cigarette smoking as it allows the determination of in cis (local) and in trans (other extrapulmonary organs) cigarette-related impairment of immune surveillance. Therefore, we aimed this study at assessing, first, whether bladder expression of MICA molecules is related with presence of bladder cancer in cigarette smokers; second, whether NKG2D+ tumor-infiltrating lymphocytes (NKG2D+ TIL) are present in these tumors; and third, whether these immunopathological characteristics relates to long term clinical outcomes such as relapse of bladder cancer and disease specific survival. Ethics and study design. This study was designed according to the guidelines for human research  and approved by the Research Committee of Human Investigation at the Hospital del Mar Research Institute (IMIM). The purposes and characteristics of the study were fully explained to the patient, without revealing any a priori hypothesis, and written informed consent was obtained from each participant. Definition of cases. For a patient to be enrolled as a case, a diagnosis of non muscle-invasive bladder cancer was required. The data base provided by the Cancer Registry of the Hospital del Mar was used as a source of information to carry out this study. Exclusion criteria were not following the care protocol controls, and have shown a tumor infiltrating during follow-up. Tissue samples. A tumor-microarray (TMA) from 127 consecutive cases of primary non-muscle-invasive bladder cancer with a minimum 5 years follow up, and formed by 127 cylinders of 0.6 mm in diameter, was screened. The TMA included five cylinders other tissues for internal control, which served to guide the reading. The construction of the bladder tissue microarray has been described previously . No cases belonged to patients who had received radiotherapy or systemic chemotherapy. Expert pathologists assessed the tumor cores. All samples were from non-muscle-infiltrating urothelial carcinoma. The distribution by grade and stage classifycation (UICC/99) is described in Table 1. Lamellae on which made the study had between 125 and 72 cylinders, the usual loss of samples during processing. Antibody sources. Anti-MIC monoclonal antibody MICA-b1 monoclonal antibody (clone AMO1; Immatics Biotechnologies, Tubingen, Germany), anti-CD4 monoclonal antibody (clone 4B12, Ref. M7310, Dako, Denmark), anti CD8 monoclonal antibody (clone C8/144B, Ref. M7103, Dako, Denmark), anti NKG2D monoclonal antibody (clone 1D11, ref. 14-5878, eBioscience, San Diego, CA, USA). Immunodetection of NKG2D expression. Human tonsillar samples were included as positive controls of CD8, CD4, and NKG2D+ cells using either immunofluorescent or immunohistochemical staining techniques. Microphotographs of phase and negative controls were included. Expression of NKG2D was confirmed using both fluorescent and visible light microscopy (Figure 1). Immunodetection of MICA expression and binomial quantification of MICA immunoreactivity. Indirect immunoperoxidase staining was utilized to quantify the expression of MICA in bladder tissue biopsies. Figure 2 shows representative MICA staining in neoplastic bladder samples. Images are shown for a) isotype control-stained sections; b) MICA-stained sections and c) computer-modified MICA-stained sections as described below. Bladder tissue samples were immediately fixed in 10% neutral buffered formalin at 4˚C for 24 hrs, and then processed for paraffin sectioning. Six-µm-thick tissue sections were stained by IHC using an indirect immunoperoxidase method (The Binding Site, UK). All biopsies were processed using and automatic tissue processor. Sections were rehydrated and blocked for endogenous peroxidase using 0.3% hydrogen peroxide. Specificity of immunoreactivity was assessed using an appropriate isotype-matched, non-relevant control antibody (IgG1, BD, Pharmingen), which was included as a negative control. Control monoclonal antibody estimated non-specific binding (i.e., background) of target primary antibodies to cell surface antigens because they showed negligible cross-reactivity with cell surface antigens on tissue sections. Isotype controls were used at identical concentrations and staining conditions as the target primary antibody. In addition, HeLa cell smears (HeLa cells are positive for MICA) were included as positive staining controls. Microscopic images were evaluated using a microscope and an image-digitizing camera. Micrographs of bladder biopsies were obtained at a final magnification of 40×. Figure 1. 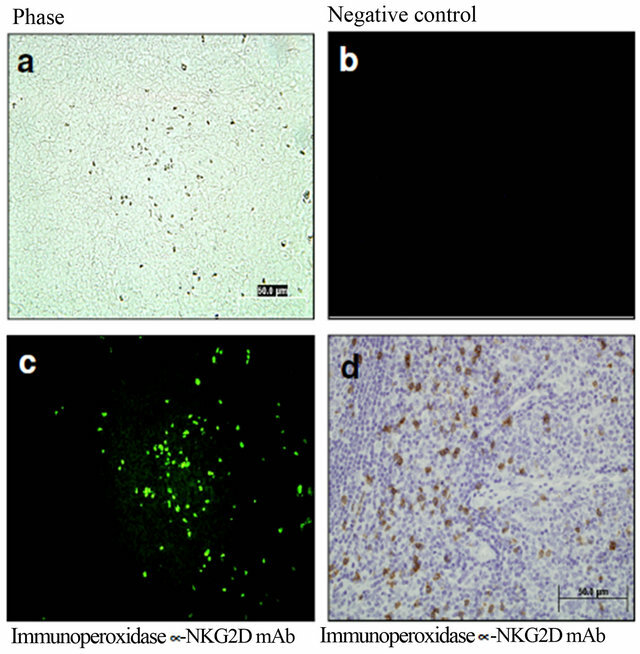 Positive controls of NKG2D+ cells using either immunofluorescent or immunohistochemical staining techniques. Representative microphotographs of human tonsillar samples. Phase (a) and negative controls (b) were included. Expression of NKG2D was confirmed using both fluorescent (c) and visible light microscopy (d). Figure 2. MICA molecules are expressed in most bladder cancer. Immunohistochemical staining of MICA molecule (AMO1 mAb) in paraffin embedded samples. Representative microphotographs (light microscopy) of samples showing variable degrees of MICA expression. Simultaneous and identical staining conditions were used for all cases. 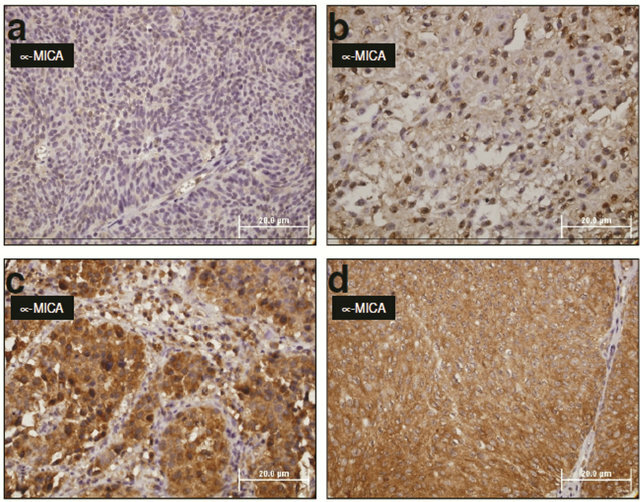 Expression of MICA was absent or under the detection limits (a) in some tumor samples, whereas most samples showed clear evidence of MICA expression with patchy (b), irregular (c) or diffuse (d) positive staining. Figure 3. MICA expression can be found in both tumor and capillary cells. 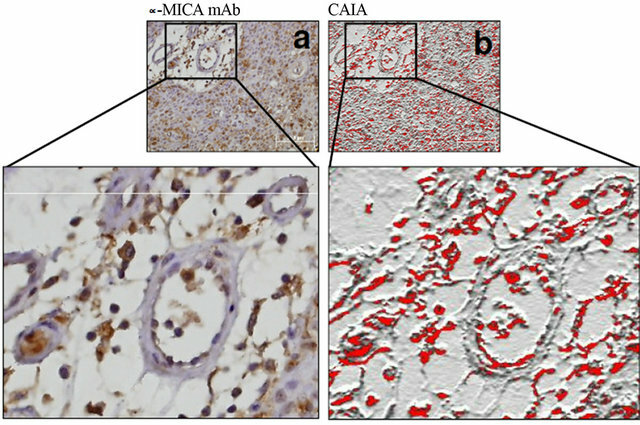 The immunoperoxidase and image CAIA disclosed clear evidence that not only bladder cancer cells but also the tumor capillaries can show MICA expression. Nevertheless, the potential implications in terms of systemic immunosurveillance remain unclear. interest and strict enough to exclude back-ground. Due to varying color hues among different biopsies, MICA immunoreactivity analysis was restricted only to a binomial scale according to stained epithelial area normalized to the overall area of each array biopsy. The rationale is that MICA immunoreactivity is positive when the biopsy sample showed a red/brown reaction pattern greater than background threshold. The rationale for negative immunoreactivity is that immunoreactivity was equivalent to, or below of background (i.e., structures such as interstitium labeled with a similar intensity). Sections of normal urothelium from 6 non-smoker subjects were used as controls. Statistical analysis of the study data was done using the SPSS package (version 15 for Windows; SPSS, Chicago, IL). First, chi-square or Fisher’s exact test were used to assess the relationship between MICA expression and patient and disease characteristics. The end-points of interest were: relapse, defined as the time of diagnosis to reappearance of the tumor, and bladder or all-cancer survival, where patients who died as a consequence of their bladder or other cancer were counted as failures. Patients who did not present any event until the end of study, those lost to follow-up and those who died from other causes were censored either at last medical visit or at death. Survival curves were estimated using KaplanMeier analysis and the differences between categories of each variable were assessed using the log rank test and univariate Cox regression. Significance was established at p ≤ 0.05. Table 1. Demographic and clinical characteristics of the study patients according to MICA expression in the bladder tumor. tients were never smokers. None of the patients were exposed to known carcinogenic materials at work or at home. During follow up, 13 (18.6%) patients had a second primary tumor, and 4 (5.7%) were diagnosed with primary lung cancer. Over the next 5 years after lung cancer diagnosis, all patients diagnosed with late stage lung cancer died. Only one patient with early stage lung cancer was alive after chemotherapy treatment, showing a partial remission of the tumor. MICA was expressed in most cancer specimens examined (i.e., 70%, Table 1). The median intensity of MICA staining was used to separate the two groups corresponding to high and low expression. There was no visible staining of nuclear or stromal compartments. Tumor infiltrating lymphocytes (TIL) were found in 64% of samples showing a frequency of 5.5 ± 16.4 CD4+ TIL, and 11.4 ± 18.4 CD8+ TIL per unit of tissue area (normalized to 1000 µm2). Cells expressing NKG2D receptor were found in only 3% of the samples and with very low density (0.2 ± 1.1 NKG2D cells per 1000 µm2 area unit). A linear function between NKG2D+ cells and number or ratio of CD4+ and CD8+ TIL was lacking. Density of NKG2D+ TIL showed no statistical association with the category of expression of MICA by the tumor cells (Figure 4). Expression of MICA in bladder cancer and smoking. MICA expression did not correlate with smoking. To assess whether this lack of association could be related to a window of inverse relationship between time since patients quit smoking and expression of MICA+ in the tumors, we included in the analysis the elapsed time without smoking. 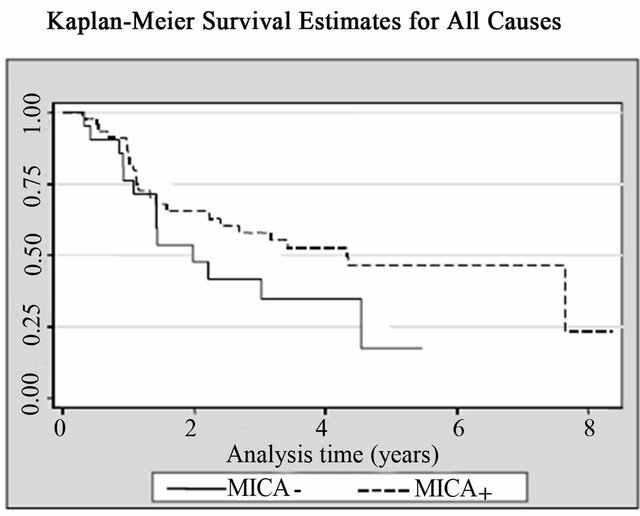 The elapsed time (in years) since patients quit smoking and the time of surgery showed no significant association with MICA+ expression in tumors (Table 1). Also, we wanted to evaluate a potential dose-effect relationship between the degree of cigarette consumption (as an index of exposure to tobacco smoke) and the expression of MICA+. The non-smokers patients were included as referent. Regardless of the cutoff, we found no difference in the rate of cumulative smoking (pack-years) and MICA+ expression (Table 1). Figure 4. In bladder cancer samples, an apparent down regulation of NKG2D expression exists as is shown, in this case, by differences in CD8+ vs. NKG2D+ tumor infiltrating lymphocytes (TIL). Table 2. Univariate Cox regression for MICA expression in the tumor among patients with non-muscle invasive bladder tumors. Events and Hazard Ratio (HR) for every outcome are presented according to MICA status. Figure 5. Kaplan-Meier curves for (a) All causes; (b) All cancers; and (c) Bladder cancer according with MICA expression among patients with non-muscle invasive bladder tumors. death compared to those with low levels (HR = 0.25; CI95% = 0.06 - 0.97, p = 0.045) (Table 2, Figure 5). The present study is a screen of MICA ligand expression and NKG2D+ tumor infiltrating lymphocytes in a cohort of primary bladder cancer patients. Using tumor microarray technology, we investigate the association of MICA expression and clinicopathological characteristics and its effect on bladder cancer prognosis. Our analyses show that MICA expression is frequent in bladder cancer. Nevertheless, a group of the tumors show low or undetectable levels of MICA expression. These MICA-negative tumors show no association with smoking status or cell differentiation. Tumor-infiltrating NKG2D+ lymphocytes were present in a small proportion of these tumors. MICA-negative tumors associate with greater risk of death due to bladder cancer or all-cancer death. MICA and NKG2D expression on NK cells and CD8+ lymphocytes may be a good indicator of patient’s immunocompetence with respect to growing tumor in the body. Our study demonstrates that expression of MICA molecules is highly frequent in bladder cancer. Tumorinfiltrating NKG2D+ lymphocytes were present in a small proportion of these tumors. The identification of antigens associated with tumor destruction is a major goal of cancer immunology. Several genetic and biochemical techniques have revealed a broad range of gene products that elicit immune recognition in cancer patients, but the biologic importance of these responses in most cases is poorly understood. While some targets are linked to tumor regressions in the context of adoptive cellular therapies or cancer vaccinations, the possible roles of immunity to most antigens in disease pathogenesis and clinical outcomes remain to be elucidated. One strategy for characterizing antigens with potential clinically significant immune recognition involves the study of patients who achieve different (durable vs. non durable) clinical benefits from present guideline-based treatment strategies. Through this approach, we demonstrate that MICA-NKG2D is aberrantly expressed in most bladder tumors. The TMA technology allows protein expression to be assessed in a large number of samples simultaneously, in a single batch, decreasing intersample or interday processing differences . Multiple studies have demonstrated that findings obtained on TMAs are highly representative of their donor tissues, despite the small size of the individual specimens . This allows the identification of broad trends in expression patterns, and correlations to be made between expression, clinical pathological features, and patient prognosis . Previous studies have assessed the intracellular expression of p16 and p21 gene products by non-muscle invasive bladder cancer to evaluate their potential role as prognostic factors, but they showed to have non-statistically significant independent predictive value . Our results are consistent with data from Cathro et al. who described MICA expression using a TMA from 167 cystectomies for primary bladder carcinoma. 128 tumors were urothelial carcinoma. In such study, MICA had significantly lower staining in urothelial carcinoma than in normal urothelium. With mean 3.6 years follow up, significantly worse survival was associated with a higher delta score in urothelial carcinoma and a lower calreticulin score in all tumor types. Delta and calreticulin protein expression was associated with survival in urothelial carcinoma and in all types of bladder carcinoma, respectively. These findings are consistent with our results and suggest that MICA defects play a role in the clinical course of bladder carcinoma. Available evidences implicate NKG2D receptor activation as a mechanistic link between epithelial cell stress and lymphocyte activation in epithelial tissues. NKG2D ligand expression is generally absent from healthy tissues but can be induced on infection, and by cell stress stimuli . NKG2D ligands are also widely express in primary solid tumors and leukemia . In cancer patients with MICA+ or MICB+ tumors, tumor-infiltrating and systemic NK and CD8+ T cells often express little NKG2D and are functionally compromised . This state has been attributed to trans-acting effects of soluble MICA and MICB cleaved from solid tumors and leukemias by a tumor associated metalloproteinase . This mechanism might explain the selection of tumor cells that sustain MICA and/or MICB expression and, rather than suggesting chronic immune activation, “predicts” that sustained NKG2D ligand expression in vivo would promote chronic immune suppression . We recently demonstrated that cigarette smoking induces aberrant NKG2D ligand expression on pulmonary epithelial cells . Using primary murine lung epithetlium isolated from mice chronically exposed to cigarette smoke and cultured epithelial cells exposed to cigarette smoke extract in vitro, we demonstrated induced expression of the NKG2D ligand retinoic acid early transcript 1 (RAET1) as well as NKG2D-mediated cytotoxicity. Furthermore, a genetic model of inducible RAET1 expression on mouse pulmonary epithelial cells yielded a severe lung disease (emphysematous phenotype) characterized by epithelial apoptosis and increased CTL activetion, which was reversed by blocking NKG2D activation. We also assessed whether NKG2D ligand expression corresponded with pulmonary disease in human patients by staining airway and peripheral lung tissues from never smokers, smokers with normal lung function, and current and former smokers with COPD. NKG2D ligand expression was independent of NKG2D receptor expression in COPD patients, demonstrating that ligand expression is the limiting factor in CTL activation. Moreover, MICA expression in the airways was statistically associated with presence of lung cancer . These results demonstrate that aberrant, persistent NKG2D ligand expression in the pulmonary epithelium contributes to the development of COPD pathologies, and is potentially associated with an acquired impairment of cancer immunesurveillance. In the present study, the statistical analysis of MICA expression highlights relationships to clinical outcomes suggesting an immunological link between cigarette smoking, NKG2D-MICA system and susceptibility to both bladder and lung cancer. Nevertheless, it is interesting to note that MICA expression did not correlated with smoking. It might be that the non-smokers patients have an underestimated passive smoking history which could explain why no association was found. Nevertheless, we must emphasize the absence of association between the tumor expression of MICA and the time of quitting smoking or the cumulative dose of smoking (i.e., packyear index). Thus, tumor MICA expression is not necessarily due to active chemical stress in the face of current smoking or the consequence of heavy smoking only. We interpret that persistent MICA expression is the conesquence of some genetic and/or epigenetic mechanisms are perpetuated after quitting smoking and even in the face of non-heavy cigarette smoke exposure. Collectively, these evidences suggest that the pathological links between MICA and NKG2D receptor in bladder tumors share more than anecdotal or descriptive information. The overall survival of patients with nonmuscle invasive bladder cancer is usually long, regardless of the histological grade of the tumor . On the contrary, lung cancer patients display poor survival, apart from early stage tumors, which can be surgically removed. Intravesical instillation of BCG is still the immunotherapeutic treatment of choice in most non-muscle invasive bladder cancer with high-grade and carcinoma in situ (CIS) in Europe and the USA [27-29]. The BCG immunotherapy causes a local response which is determined by the secretion of cytokines identified in urine and biopsies of the bladder wall, with infiltration by mononuclear cells and granulomas [30-32]. It causes a local immune response in the urothelium and a potential antitumor effect [33,34]. The magnitude of specific responses may be increased with the number of instillations, which justifies the maintenance dose protocols for years in patients with risk factors, but the therapeutic effect of BCG is not dose-dependent . The intrinsic mechanisms of the antitumor effects of BCG still remain unclear . A possible mechanism of intravesical BCG therapy for human bladder carcinomas is the involvement of innate effector cells for the inhibition of tumor growth . Several reports demonstrate the involvement of NKG2D in antitumor responses, immune surveillance and suppression of experimentally induced tumors . This mechanism has been put forward and studied in other solid tumors, and the understanding of the progresssion of metastasis [38,39]. These findings suggest the involvement of innate alert cells activated by the live BCG-infected dendritic cells to inhibit the growth of bladder carcinoma and provide a possible mechanism of intravesical BCG therapy. A recent study assessed the risk of developing lung cancer in patients with bladder cancer . Interestingly, among patients with nonmuscle-invasive TCC of the bladder, mortality from lung cancer represents a significant risk. Some authors suggest that patients with bladder cancer should be considered for lung cancer screening protocols . In the present study, we provide support for the hypothesis that NKG2D-ligand is expressed in most (>70%) bladder cancer specimens. This expression associated with an apparent downregulation of NKG2D in TIL, and probably affected cell-mediated cytotoxicity against toxicant (e.g., cigarette smoke) exposed urothelial cells. As a form of epithelial tumor clearly associated with chronic cigarette smoking, the present study suggests that extrapulmonary organs disclose cigarette-related impairment of innate immunity. Tumor-infiltrating lymphocytes are present in the tumoral tissue but disclose a downregulation of NKG2D receptor. These immunopathological characteristics associate with long term clinical outcomes in patients with bladder cancer suggesting that NKG2D-MICA system could represent a common mechanism involved in the immunopathological natural history of lung and bladder neoplasms. The present study has limitations. 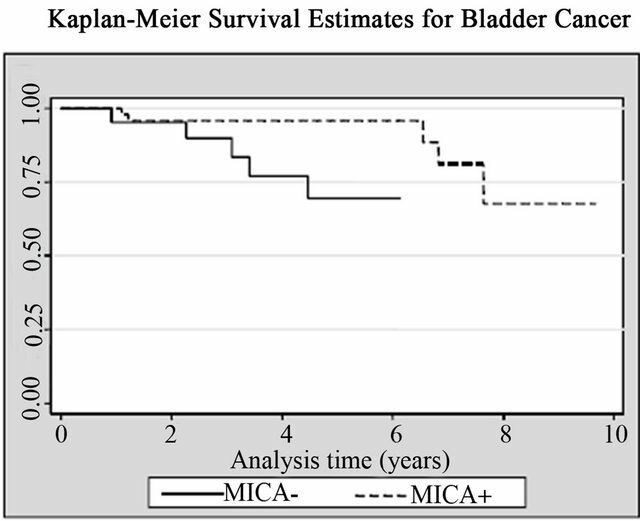 Despite the limited number of participants, this study had enough power to document a statistically significant association between the MICA expression and cancer mortality, especially that caused by bladder cancer. This finding suggests that the protective effect is such that it can be demonstrated even in small case series. However, we consider that it is necessary develop more studies to evaluate the consistence of this association in other populations. 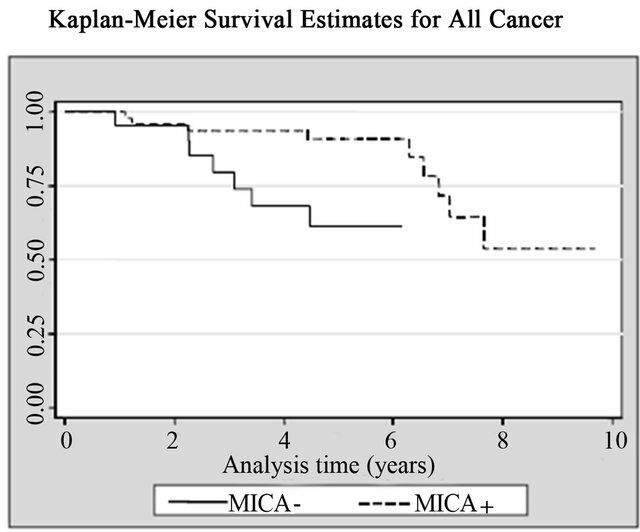 Also, a larger sample size would be needed to assess the relationship between the MICA expression and other outcomes (e.g., bladder cancer relapse) and its impact on total mortality. Finally, the information regarding smoking status was obtained from the clinical charts and we may not exclude the possibility of classification bias. Expression of the potent NKG2D ligand MICA and an apparent downregulation of NKG2D receptor in tumor infiltrating lymphocytes are evident in bladder cancer specimens. MICA expression showed significant survival advantages in the face of both all-cancer and bladder cancer. There is biological plausibility and a therapeutic potential on urothelial cancer related to manipulation of MICA-NKG2D pathways. A. F. Kantor and J. K. McLaughlin, “Second Cancer Following Cancer of the Urinary System in Connecticut, 1935-82,” National Cancer Institute Monograph, Vol. 68, 1985, pp. 149-159. R. Doll and R. Peto, “The Causes of Cancer: Quantitative Estimates of Avoidable Risks of Cancer in the United States Today,” Journal of the National Cancer Institute, Vol. 66, No. 6, 1981, pp. 1191-1308. E. Salminen, E. Pukkala and L. Teppo, “Bladder Cancer and the Risk of Smoking-Related Cancers during FollowUp,” Journal of Urology, Vol. 152, Pt. 1, 1994, pp. 1420- 1423. L. F. R. Vallmanya, R. A. Laborda, T. J. Lloreta, A. R. Cortadellas, S. J. Placer and G. A. Mas, “Immunohistochemical Expression of p53, p21, p16 and Ciclin D1 in Superficial Bladder Cancer. A Tissue Microarray Study,” Actas Urologicas Espanolas, Vol. 30, No. 8, 2006, pp. 754-762. A. L. Rodriguez, F. V. Llena, R. C. Angel, J. L. Trull and A. G. Mas, “Histopatological Validation of Tissue-Microarray Technology in Urotelial Cancer. Our Experience,” Actas Urologicas Espanolas, Vol. 28, No. 3, 2004, pp. 215-220. A. I. Roberts, L. Lee, E. Schwarz, V. Groh, T. Spies, E. C. Ebert and B. Jabri, “NKG2D Receptors Induced by IL-15 Costimulate CD28-Negative Effector CTL in the Tissue Microenvironment,” The Journal of Immunology, Vol. 167, 2001, pp. 5527-5530. A. Bohle, J. Gerdes, A. J. Ulmer, A. G. Hotstetter and H. D. Flad, “Effects of Local Bacillus Calmette-Guerin Therapy in Patients with Bladder Carcinoma on Immunocompetent Cells of the Bladder Cancer,” Journal of Urology, Vol. 144, No. 1, 1990, pp. 53-58. A. Martino, R. Casetti, A. Sacchi and F. Poccia, “Central Memory Gammadelta T Lymphocytes Primed and Expanded by Bacillus Calmette-Guerin Infected Dendritic Cells Kill Mycobacterial-Infected Monocytes,” The Journal of Immunology, Vol. 179, No. 5, 2007, pp. 3057- 3064. Z. Madjd, I. Spendlove, R. Moss, S. Bevin, S. E. Pinder, N. F. S. Watson, I. Ellis and G. Lindy, “Durrant. Upregulation of MICA on High-Grade Invasive Operable Breast Carcinoma,” Cancer Immunity, Vol. 7, 2007, pp. 17-27. J. del Rey, J. Placer, F. Vallmanya, N. Pujol, E. Prat, R. Miró and A. Gelabert, “Are Patients with Non-Muscle Invasive Bladder Cancer a Suitable Population for a Lung Cancer Screening Trial?” British Journal of Urology International, Vol. 106, No. 1, 2010, pp. 49-52. *Sources of support: this work was supported by grants from the CIBER de Enfermedades Respiratorias (CibeRes), Instituto de Salud Carlos III (ISCIII), Ministerio de Ciencia y Tecnología, Spain; the ISCIII-FEDER (PI08-1612) and the Fondo de Investigación Sanitaria (FIS), Ministerio de Ciencia y Tecnología, Spain (PI: 02/0468).